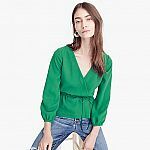 J.Crew has sale items (399 new picks added) for extra 50% off with promo code "EXTRAEXTRA". Shipping is free for Reward Members (free to join). Deal ends 4/5. Today only, J.Crew takes an extra 60% off all sale items via coupon code "APRIL". Even better, Rewards members get free shipping. (Not a member? It's free to join.) That's the second highest extra percent-off discount we've ever seen from J.Crew. Some exclusions may apply. J.Crew is offering an extra 60% off sale items with promo code "APRIL". Shipping is free for J.Crew Reward Members (free to join). Deal ends 4/1. 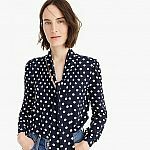 J.Crew takes an extra 50% off sale styles via coupon code "NEWSTYLES". The same code also takes 30% off men's and boy's suiting. Even better, Rewards members get free shipping. (Not a member? It's free to join.) That's tied with our mention from two weeks ago discounting sale styles and regularly-priced items. Deal ends March 17. Take an extra 50% off final sale styles (prices ending in $0.99) with code NEWSTYLES. Sign up for JCrew Rewards for a unique code for additional 15% off (in incognito, popup will come up and code appears on site instantly), or when you sign up for an account, you will get an email in 5 min or so. Shipping is free when you are logged into your JCrew Rewards account. 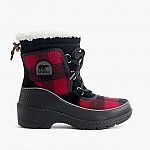 J.Crew has J.Crew X Women's Sorel® Tivoli™ III boots for $99.99 - 50% Off with code "23HOURS" - 15% off (with Sign up for JCrew Rewards) = $42.50. Shipping is free. Take an extra 50% off final sale styles (prices ending in $0.99) with code FRIDAY. Sign up for JCrew Rewards for a unique code for additional 15% off (appears on site instantly). Shipping is free when you are logged into your JCrew Rewards account. Today only, J.Crew takes an extra 50% off sale styles via coupon code "FRIDAY". The same code also takes 30% off regularly-priced items. Even better, Rewards members get free shipping. (Not a member? It's free to join.) That's the first percentage off non-sale items we've seen from J.Crew so far this year. J. 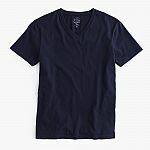 Crew Factory has J.Crew Mercantile T-Shirt on sale for $6.99 - 50% w/ code "FRIDAY" = $3.49. FREE SHIPPING when you sign up for a free JCrew account. Take an extra 50% off final sale styles (prices ending in $0.99) with code FRIDAY. Sign up for JCrew emails for a unique code for additional 15% off (get offer via site pop-up, code then appears on site instantly). Shipping is free when you are logged into your JCrew Rewards account. Take an extra 60% off final sale styles (prices ending in $0.99) with code SHOPTOIT. Sign up for JCrew Rewards for a unique code for additional 15% off (takes about 5 min or so to arrive). Shipping is free when you are logged into your JCrew Rewards account. J.Crew has Extra 60% Off Final Sale Styles (items Ending in $0.99). Shipping is free for Rewards Members, Free to Join (Plus 15% Off Unique Coupon for New Members). Extra 60% Off w/ Code "SHOPTOIT"